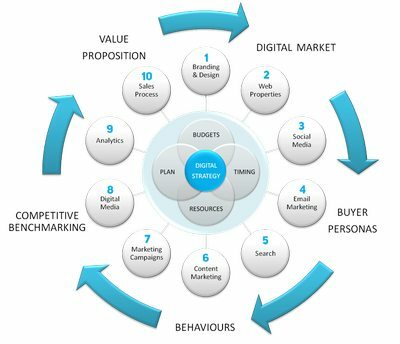 Where to start, what to cover, how to analyse and assess the most important digital channels and how to build a digital marketing strategy that has real sales impact. This is a high impact morning workshop for Marketing Managers and others who are responsible for developing effective digital strategy. It introduces structured methodologies and gives you a process for digital planning that will help ensure your bases are covered. The workshop features slides and live demonstrations and is supported with highly interactive discussion and perspective exchanges from participating companies. A download link for supporting slides and other reference materials used during the workshop will be emailed to participants after the course. It may not surprise you (too much!) to know that most companies who engage digital marketing do so without having a digital strategy in place. But the most successful digital adopters are those who have one. What make them more successful? Doing the right things, right, first time. The Digital Strategy planning process. Where does Analytics fit in?